I was at a dinner party recently where a group of women were discussing how their hairstyles had changed over the years, where they got their hair done, and how often they dyed their hair. We mused on when was a good age to give up the hair dye and go grey gracefully, which led onto a confessional session on the discreet use of eyebrow pencils and mascara to hide stray white hairs in brows and lashes. Then one of my friends cheerily proclaimed that at least with her hair turning white, the rogue hairs that had been appearing on her chin were better disguised, since they too were turning white. We all laughed – it was a relief to many of us in the group to realize that the appearance of stray hairs in new and unusual places was happening to other women too! The increase or change in hair is caused when the previously predominant hormone estrogen, which creates fine and generally fair “vellus” hair, is overtaken by an increase in the “male” hormone testosterone which results in “terminal” hair, which is thicker, coarser and darker. Perimenopause and some hormone replacement treatments can cause this change. I think that’s what they call a lose/lose situation! Unwanted facial hair varies from person to person. Some might discover a few stray hairs on the chin, while others notice a change in texture and increase to hair on the upper lip. What used to look like a light “peach fuzz” might transform into more of a manly moustache. Some women even grow a beard. Other women might notice extra hair on their cheeks or forehead. Understandably, the worst sufferers are looking for a solution that doesn’t just involve a razor and shaving foam! 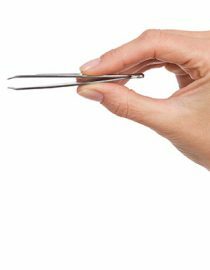 There are a number of effective methods of hair removal, starting with using a good quality pair of tweezers! I keep a set in my handbag since I always spot the hairs on my chin in public restrooms where the light is better than in my bathroom. I find the mirror in my car’s sun visor very effective for finding stray hairs, too – hopefully not too many people have noticed me plucking while waiting for my children in the school parking lot! Only you can decide how bothered you are about the hair. Do you want to commit to visiting a salon regularly, or would you rather use products at home? How much time and money do you want to put aside to keep yourself hairless? How much pain can you stand? You could try bleaching, waxing, depilatory creams, an epilator, laser treatments or electrolysis, where an electric current damages follicles so that after several treatments hair no longer grows back. It’s entirely a personal choice. Next page: additional hair removal techniques.